Gitlab CI is one of a bunch of CIs configurable with a file in the repository. With over 25 repositories sharing a similar configuration maintenance becomes annoying. My team is building integrations. We can’t seem to stop. There’s over 20 of them now and each has a build pipeline. We even managed to get them to be really consistent in terms of tooling, builds and deployment. sed in a loop was my editor of choice for a while. Now with everything reaching consistency, it’s time to address the overlap. .gitlab-ci.yml defines the pipeline, so it’s not possible to install something external as the first step of the pipeline to affect the rest. .gitlab-ci.yml allows importing external files from the repo or a URL. That sounds great. External URLs don’t support authorization, so we’d have to put some infrastructure in place to have parts of .gitlab-ci.yml shared between projects, but not available to general public. You know, security. Also, if all configs point to the same URL, it’s just one version shared across all pipelines. Instant updates or no updates. The big leap I had to make was to think of .gitlab-ci.yml as code not configuration. If it’s code, I need to reuse it. If I’m reusing code, I put it in a shared library. If I have a library, I version it so I don’t have to spend a few days rolling it out to each project with each change, but can do so progressively when revisiting projects while they continue to work fine with previous version. The idea is not new. We’re using internal libraries to reuse code better. Logger, database abstractions etc. - they’re all packages we install in each app and their development follows semantic versioning. I can include a file and use a stage from it, put it in the right order with others etc. Included stages are configured with variables. Variables from the main yaml are accessible in included code. When I install the library at a certain version, I get a folder with reusable yaml in my repo root. Just need to commit it and it can be included in the main .gitlab-ci.yml. We now have full control of the versions. If I want to update the CI pipeline across all apps, I run npm update gitlabci-shared-config in a loop across repositories and commit changes. If I need to update the version for only one app, or the update requires changes in the app itself - I have control over how and when the update rolls out. Also, the generated folder comes with a readme file explaining usage docs matching the installed version and a version file containing the version number so it’s easy to spot if/when it goes out of sync. There’s no obvious way to stop someone from editing the installed files - they have to be committed to the repo because there’s no step before .gitlab-ci.yml includes other than git commit. We’ve been using this for a few weeks now and It’s proving useful for sharing parts of Gitlab CI configuration across 25 independent apps. I should post some more tips for dealing with maintenance across many applications without the need of a monorepo. Maybe a series of posts? Let me know on twitter. More updates on shared CI config coming soon! 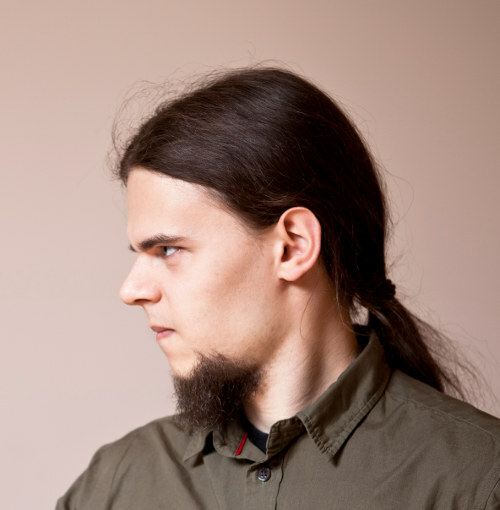 Zbyszek Tenerowicz @naugtur Full-stack developer and technology researcher. Runs a growing number of Node.js powered applications in production at Egnyte Inc. Open-source enthusiast. Teaches web technology to designers and peer developers. One of the oldest members of Meet.js Poland community - both as a speaker and organizer of local meet-ups.